In light of the choir fiasco last night (see previous entry), Cuppa determined that she should take me out for an appeasement breakfast this morning, just a breakfast sandwich and coffee from Tims taken to the riverside. It's nice and sunny out there, but the temperatures are on the low side, about 34°F now and only going up to about 43°F. While that's not exactly tropical, it's not windy, and we may get the bicycles out. We're thinking it over at least. Usually, we get out a few times in March, but the weather hasn't been conducive this year. On the few occasions that the temperatures have begun to even approach accommodation, the winds have been too strong. While today's temperatures aren't terribly appealing, the sun is out and the winds are down, so we might possibly manage a short ride if we're well-bundled. We shall see. Whatever we decide, spring has sprung. 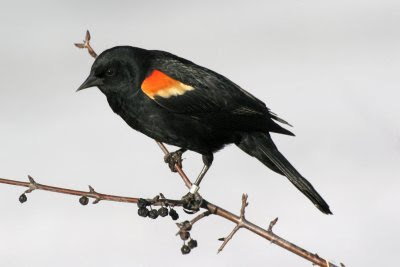 In a recent post I mentioned the sighting of Red-winged Blackbirds. As synchronicity would have it, I discovered the above photo on Doris' (neither Doris's not Doris'es looks right to me) photos site yesterday. She honoured me with posting privileges, so that's what I have done as I have done before. Meanwhile: to bike or not to bike? That made me laugh. It (A Time to Keep Silent) was the title of tonight's chapter in my nightly reading to Cuppa, for, at that very moment, I was despairing deeply over the sounds that I had been trying to make, sounds that hadn't come out well. You see, I had wanted to sing certain sounds tonight. I had practised them diligently, but I had totally flubbed my part during rehearsal. So, it was good to chuckle for a moment. Is that just a tad cryptic? Well, here's the story. I went to choir practice tonight for the third week in a row although the choir had been rehearing for a month prior to my arrival on the scene. They are starting a new community choir in this area, and a neighbour who overheard me vocalizing around the house (I do that a lot — hum, whistle or sing — almost without realizing it) asked me to join. When I hesitated and explained that I really have difficulty harmonizing, she asked me to try anyway and extracted my promise to try going to two practices before making up my mind. So in the due course, I showed up for the first practice and was rather mortified to discover that I was the only guy there. Not being a reader of music, not for singing purposes anyway, I made myself sit and observe and maybe hum the occasional bar. But they sounded good, and I decided that I'd really like to be a part of the group. So, I got hold of the music and tapes of the bass part. Unfortunately, I didn't have much time to practise my part before the next (my second) rehearsal (last week). Nevertheless, I was aided by the fact that I wasn't the only guy. Indeed, I was able to sit beside a fellow who more or less knew the ropes. I followed him, sometimes behind the beat and sometimes badly, but there was reason for hope. So, this past week, I practised some more and thought that I was ready for tonight's rehearsal (my third). I was quickly disabused, however, because I was not, in point of fact, ready at all. Unfortunately, I was the only guy again, but because I had practised on my own, I thought I'd be able to muddle through to some degree. However, I'm afraid I really, really floundered when it came down to it. You see, although I can pretty well sing the bass part when I'm by myself, it happens that as soon as the full music starts and everybody starts singing their parts, I get totally lost and seem unable to fathom what notes I am supposed to be singing. When surrounded by those other voices, I can't seem to hear my part in my head. Tonight, it was so bad that I really would rather have been almost anywhere else, but a grown man can't really run out, so I stuck it out ... and despaired of my plight during every agonizing moment. I disappoint myself. I know that I don't have a solo quality voice, but I can sing. I mean to say that I can carry a tune. It's just that I can't seem to sing harmony when all of those other voices get going, especially if there's no one to help me along. I'd like to sing with this group, but I really need strong bass voices around me to lead the way. Do I go back one more time and hope that those other guys will show up, or do I just toss in the towel? I hate to be a quitter, but maybe this is beyond me. I don't know why I find it so hard when it seems so easy to others, but I do, and it frustrates and disappoints me. I feel stupid. So, maybe, for me, it really is "A Time to Keep Silent." But it no longer makes me laugh. I don't see a robin. Do you see a robin? Oh, we saw one last Thursday and again on Friday, and on that Friday I scurried to get my camera. Of course, just as I was getting focussed, the *&%$ bird flew away. But I left my camera right there by the bedroom window to make sure to capture him the next time he showed up. Today, I gave up. *&%$ bird. But the relevant point is that they have returned. So have the Canadian Geese (Canada Gooses? ), but I don't have a picture of them either. I took a few, but they were either boring or blurry or both. Cuppa noticed a redwinged blackbird today, and Thesha has crocuses coming up, so Spring is definitely here, and life is good. Yes, it's good, especially tonight, because I have my computer back. You may not have noticed that it was gone because I was faking it pretty well, but I took it in last Thursday, and they called today (Wednesday) saying it was ready. That's not a terrible turn-around time when you consider that they had to send it to Montreal for servicing. That's where Staples does its extended warranty work, at least for this region. I was skeptical when they told me that all they did was clean it, but it seems to have resolved my problem. I performed the one function that would previously be sure to crash the machine, and it didn't, so we'll pronounce it fixed. In the interim, I was getting around to at least some of your blogs on a hit and miss basis, but I left even fewer comments than usual. Sorry about that, eh? Hah! I just found this photo from one of my Flickr buddies, kiwêhowin (Heather), who lives further north than I, but I'm not exactly sure where. Spring is springing up there too! Nicely done, Heather. A new Maple Sugar camp/restaurant, Temple's Sugar Camp Restaurant, recently opened in tiny Ferguson's Falls, not too far from here. Despite the fact that Lanark County proclaims itself the Maple Syrup Capital of Ontario, there are only two other establishments that I know of within an hour's drive of us. So, we headed out thataway last Friday. It was a delightful day in these parts as you can tell by Cuppa's rather light attire (for March in Canada). It's a brand new building that is rather wonderful inside. We were told that the family built it themselves over a five year period. There are two balconies, and the place will supposedly seat 700 people when it is able to sustain maximum capacity. If they ever do fit 700 seats in there, that would probably be about fifteen times the normal population of Ferguson's Falls. It may come to that too because although it's not totally finished inside, lots and lots of people (like us) have been showing up regardless. The parking lot was still pretty full when we arrived shortly after one o'clock although the restaurant was fast emptying. Apparently, it's been fourteen years since the McEwen Pancake House closed. Despite it's rusticity and small size, it is said to have once served a thousand patrons in a single weekend. The old structure still stands. You can see it next to the new edifice, two photos above and in the photos below. I'm glad they left the old place standing, but I'm even gladder that I got to enjoy the new place. As you know, it was Cuppa's birthday weekend. As per usual, the grand lady somehow managed to stretch a one day event into five. But who's counting? One of the events was an actual birthday day dinner and cake (of course) chez les kids, which is French for at the kids' house — in my version of French anyway. Before dinner, we had the ceremonial laying on of hands upon the Smudge, or as near as we could get to her. She was being a very active little thing at that point; we could often see the evidence of her rummaging and rumbling about. No doubt, she's getting a might crowded. I get claustrophobic just thinking about it. Later, Theboy decided to exercise his masculine muscularity by picking up an older woman. Hey! When I was his age, I could do that too! Hmmmpppph. He does have an advantage, however, as he once trained to be a fireman. It is my understanding that more photos will appear on Brown Betty Brew, eventually. Congratulations to Cuppa who reached the big SIX-OH today. Although beginning her seventh decade on this planet and about to be a granny, guess what youthful plaything she wanted for her birthday? That's right: a bicycle carrier. Presumably, the bikes will come off and get pedalled when appropriate, bike-friendly destinations are reached. That's the theory anyway. There are bicycle paths in Ottawa that beckon, and the season is fast approaching. In fact, I've seen a few early birds pedalling around town just this weekend, even though we had snow again yesterday. Yesterday, on what I'll call the first day of spring although some will argue that I'm a day off, Cuppa and I headed to Riverside Park for a junk food lunch. My back had cooped me up for a few days, but it was somewhat better, good enough to sit in the car anyway, so out we went. We have a great burger joint in town, a non-chain place. While it's a little pricier than the ubiquitous franchises, the food is better than the standard fare. Everything is made from fresh and not frozen, and both the burgers and fries are yummy. Imagine my surprise, however, when the fellow beside me ordered large fries — with butter if you please ... or as he pleased. As I waited for our order to be filled, I scanned the board and realized for the first time, that butter was, indeed, an option. Yesiree, you can have fries with gravy or fries with butter or fries with both gravy and cheese curds (that's called poutine btw). I knew about the gravy and poutine, but butter on fries was and is totally new to me (on this, only my third visit ever). Sure enough, after they scooped the fries into the container, they poured melted butter over them, just as one would with popcorn. I can't imagine but chacun à son goût as they say in the province to the east. Off we drove to the park as we often do although seldom with a deliciously greasy lunch in hand. The temperature hovered around freezing, but the sunshine made it quite balmy inside Harriet the Chariot. I gazed out and saw a splash of white way out there on the water. As I studied the spot, I came to realize that it was a swan: a solitary swan. I've never seen a swan around here before, but on the first day of spring there it was. I used a telephoto lens, so the picture isn't as clear as it might be, but I like the fact that I was able to frame both it and the Canada Goose between the tree trunks. I suspect that the goose was one who had wintered over. Some do that rather than go to the trouble flying south — silly things. How odd: butter on fries and a swan on the river where there has never been one before, even in summer. Did you encounter any oddities on your first day of spring? Just the other night, I had a strange memory. I happened to get up and look out the window during a snowfall. The street behind us hadn't yet been plowed. This caused me to recall Mr Workman who worked at snow clearing for a nearby town where I used to teach. I remember his daughter saying how he'd be so anxious for it to snow, so they would call him into work. The thing is, I don't know Mr Workman, and his daughter never told me that. It was my daughter who told me that Jodie had relayed that piece of information to her. Maybe I remembered it because I had once taught Jodie before Thesha ever know her. Thing is: why would I retain a useless bit of trivia like that — for about 15 years now? Both you and I have heard that we only use 10% of our gray matter, but I have recently heard that it's not at all true, that our brains get quite full. They get so full that at a certain age the only way to learn new stuff is to forget old stuff. Maybe that isn't true either, but it was said by an expert/scientist, so I tend to give it some credence. Question: if my brain is so darn full, why it would choose to hang onto that rather useless tidbit, especially in light of all of the things that I do forget? That leads me to another memory prompted by reading State Street today. He remembers crying after bloodying a kid's nose. Of course, that brought a somewhat similar memory of my own to the surface. Well, it wouldn't be anyone else's memory would it? Preston and I were arguing about something or other, and I guess we put our dukes up, and I smacked him in the jaw. That startled me so much that I turned and ran away. I guess if I hadn't, I would have had to fight some more, and I knew that I could handle him, and I didn't really want to do it. I suppose that I am a pacifist at heart and was even then at the tender age of nine or ten. I'm pretty sure that I've used that song before. Maybe it was a different verse, however, and, anyway, it's so appropriate today that I insist on using it again, regardless. You see, I'm in much discomfort. Just a few days after bragging to a neighbour about how wonderful my back has been for about a year or longer, it decided to go out. I hate it when that happens because I never know when it's going to come back, and it is really difficult to live without it. This morning, I am bound and determined to spend some time sitting at the computer, but even that is problematic because I can hardly tilt my head a fraction without sending spasms all the way down to my hips. But I don't quite know what else to do with myself, so I'll force myself to sit here for a while. Yesterday, I read an Inspector Rebus mystery while trying to remain as immobile as possible. I have two more Rebus tomes on hand, and I'll get to them because there's not much else for me to do, but I don't feel up to another romp around the criminal underbelly of Edinburgh just yet. I feel badly for Cuppa. It's her birthday week, and I am hardly fit to help her celebrate. Last night, we had planned to hear a female choir that is touring from Cornell University. Needless to say, we didn't. Fortunately, she has a good day planned without me. She's out to Tai Chi this morning, followed by lunch out for and with her fellow graduates from the beginner class. And she can go out to line dancing tonight while I assist Inspector Rebus in puzzling out (get it? rebus puzzle) another Scottish mystery. When it rains it pours, however. Yesterday, I dragged my sore back to the doctor to see about my sore finger [sic] — the one that has plagued me since I took up the fiddle ... the fiddle upon which I must stop fiddling for now and perhaps forever. She has referred me to a plastic surgeon. Oh joy! How does that song go again? I didn't exactly have a wonderful sleep last night. Night Heat Syndrome has been creeping its way back into my bedroom lately, but by last night the creeping was over, for it had arrived in full vigour. While I didn't sweat through as I have been sometimes known to do, I was mighty uncomfortable and spent much of the night sans covers. Just so you understand the significance of this, it's still winter here, and the house temperature probably went as low as about 16°C/61°F last night. That's not exactly a July heat wave, but I was boiling anyway. It's my own %^&$ fault, for I've learned in the past that good eating habits reduce this syndrome almost to elimination. And I was being very good for January and most of February, but bad habits have been creeping in again. As we approach Easter, there's chocolate in the house, and I can't seem to resist grabbing a few when I pass the bowl. 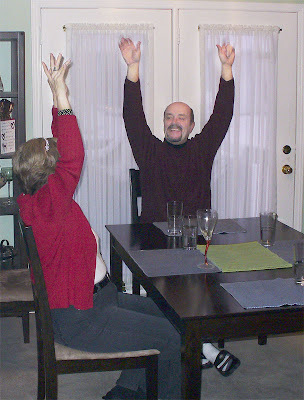 And we had the kids over for dinner last night which required white rolls, pudding with cream, and cookies. Of course, when I have cookies I tend to lose perspective. I had a few in the afternoon, a few more at supper, and another at bedtime. Not only that, but the hamburger-potato casserole that I made for dinner was not one of my light dishes. There were the potatoes themselves (don't forget they're pretty sugary), the milk, the cream and a lot of cheese. So, I really overdid it yesterday and paid the price last night. I get too confident when I seem to beat the heat for a few months by controlling my wanton appetite. Then, I let loose and suffer for it. I've never heard of anyone else who suffers these heat symptoms, though. It never used to happen to me either; it's just something that has manifested itself in these later years. I didn't really know what caused it until I was eating very properly several years ago in an attempt to reduce my weight a bit. I began to notice that I was no longer suffering form night heat, but whenever I returned to my poor eating habits, the heat returned. So, I must return to my healthier habits. They won't likely pay off immediately, but perhaps I'll notice an improvement within a few nights. But why oh why, am I cursed with taste buds that crave all those goodies baddies? Why can't I be one of those who gets off on carrots? Hmmm? What a difference a day makes! 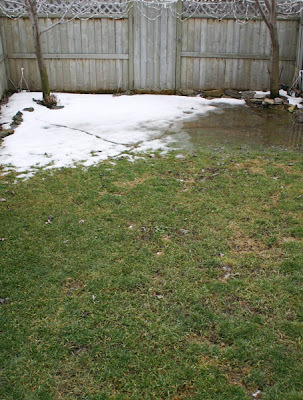 Yesterday morning, although I was pleased to see the snow pulling back from the edges, there was still 6 to 8 inches of snow covering most of our back yard. After a nice day but without the help of rain, I was surprised to see that much of it was gone by evening. By this morning, even more was gone, and above is what it look liked by noon when it did begin to rain. That's quite a difference! It must have happened before in my life, but I can't remember noticing such a change within such short time span. 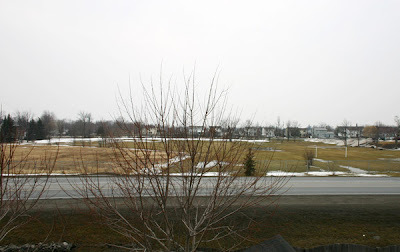 Further out back, on the other side of the street, there are fields belonging to the community and school. These fields were also covered with snow just yesterday. Although this post dovetails fairly nicely with the last two, it's actually been vaguely in my thoughts for quite a while now. It's about Evan, who is a very nice and extremely talented guy. I admire Evan a lot although I might appear not to as I use him as a bit of a whipping boy for the purposes of this post. Actually, the post isn't really about Evan; I simply use him as an example of what I think is a universal truth: that there is a very fine line between our personality strengths and weaknesses. I taught with Evan, was his department head for six years. He was actually my main competition for the job, but I got it, and, although he thought he was the better candidate, he never harboured a grudge against me. He did rather hold some animosity against the people who made the choice, I think, but never made it personal between the two of us. Evan was my antithesis: an extrovert of huge proportions to my introvert. Unlike the easily tongue-tied me who almost needs to write things out before he speaks, Evan's brain actually engaged when he began to speak, and could he ever speak! It wasn't vacuous verbiage either; he knew a lot about a lot and seemed to remember almost everything that he read. He was able to weave such interesting and diverse threads into his lessons and, somehow, always get around to the point. I once told him that I could give him any topic on the first day of class and that he could start with that topic, weave it into the course material in some magical way and keep going for the whole school year. He could, in point of fact, keep it going for the whole school year, and — he did! Yes, he did! Believe it or not, he talked or lectured almost every minute of every period for the whole course. It didn't matter whether he was teaching a non-academic, freshman high school class or an advanced, senior, academic group, for Evan had one lesson plan for each and every day — talk ... and talk. Every day, every period, a group of students would walk into his room and would sit down for the 75 minute session. Evan would open his mouth and begin to speak. He would speak for 75 minutes. This, folks, was not the height of advanced and perspicacious, pedagogical approaches. Students, especially the younger ones, are known to have short attention spans. Supposedly, teachers should find a variety of activities to keep their young charges fresh and stimulated. But that didn't concern Evan. You see, he thought he was great, that the kids loved him and hung on his every word. He never clued into the fact that most of them were gone for about 70 of the 75 minutes. An introvert would have been more sensitive and read the cues better, but not Evan. Don't get me wrong. He was wonderfully interesting — to me! a mature adult, who frequently listened in amazement from the department office just off the back of Evan's classroom. I constantly admired his knowledge and his oratory. He was truly remarkable but out of touch with adolescent reality and, in effect, the exact opposite of what he thought he was. For he was not the great teacher that he supposed — far from it. He was smart and talented but not a good teacher, not for secondary school level anyway. His brain and abilities dwarfed mine, but in one unfortunate year when we had to share a class (take turns — weeks on and weeks off), one of our lesser-light students once confided to me that while Evan was a nice guy, he never learned anything when Evan was in charge. My point isn't to slag Evan, and I would feel simply awful if he ever read this, which he wouldn't. No, my point is this: that every person and personality type has his or her strengths and weaknesses and that it can be quite a challenge to maximize the former and minimize the latter. Evan had a rare gift, but, in my opinion, he abused it, and it actually became his achillies heel. It's easy to do. In my case, my introversion gives me the gift of being fairly self-motivated, self-reliant, and competent, but, on the flip side, I tend to let myself become too isolated and independent. I think there really is a fine edge between any trait being a strength or becoming a weakness. It's my guess that most us us cross back and forth over that line. Perhaps awareness can lead us to spend more time on the good side of the line than the bad. And if you ever read this, Evan, I respect and admire you, for you am what I ain't. Just a few brief additional thoughts to yesterday's post. It's interesting to delve into personality types, isn't it? I have actually requested that the library reserve a copy of Laney's The Introvert Advantage for me. I don't expect it to appear anytime soon, for I'm 40th in line, but there is more than one copy in circulation, so it might not be too long either. One thing that I didn't mention in the previous post about introversion was that they claimed that this was something that is hard-wired into us. It has to do with the construction of the brain, as I understand it. I had always thought that these sorts of things had more to do with nurture than nature, but it seems that I was wrong. I would think it likely, however, that nurture could certainly modify one's degree of introversion — or any other personality trait for that matter. When I ponder my days of teaching and how much I enjoyed teaching English, I can see how personality may have come into play. Whether you discuss Shakespeare or a novel or a poem, there is always room for interpretation and the sharing of thoughts and ideas. As an introvert, I was quite happy to hear what the kids thought of this or that, and, as most of them were extroverts (apparently), I'm sure that many of them were pleased with the opportunity to voice their opinions. My other subject, geography, was more of a tell it type of subject, so it was probably less of a natural fit for both teacher and many students. I happened to turn on the news last night; I guess it was a sort of Sunday Magazine more than normal news. I was soon hooked by a segment on introversion. They started with a test. There were seven items. I remember two: are you a listener or a talker, and, do you tend to not know what to say in social situations. That last one wasn't exactly the way that it was put, but that was the general idea. The results were predictable. At this stage of life, or any other, I suppose, I don't really need test results to tell me that I am introverted. However, I think I was a little surprised to be such a full-blown case because I think that I came down rather solidly on the introvert's side on all seven questions. Just last week, at line dancing, I found myself in a typical situation. I was seated between two groups of people and was part of neither group really ... or both ... take your pick. What I was doing was listening to first one group and then the other. That has occurred to me often, for I am much more of a listener than a talker. And that's typical of the introvert. They did say that introverts can be quite adept at talking on-subject: able to carry on a meaningful conversation with substance but not so good at small talk or starting up a conversation that has lagged. Although, they couldn't get into the topic in huge detail in a ten-minute segment, I begin to suspect that such personality traits can affect how we learn. For example: I can't seem to learn a new line dance in a group situation. Rather, I seem to need to take the steps home and process them in my own way — at my own speed and in my own time. And I seem to see a similar thing occurring with my fiddle lessons. If I am introduced to a new concept, and it can be quite simple, it seems to fluster me. However, when I take it home, I am very likely to get the hang of it without too much trouble. According to this program, about twenty-five per cent of us are introverts, and it is often seen as almost a stigma or disadvantage. People don't always understand us or may think that we're stand-offish or stuck-up, but that's hardly the case. This idea of introverts needing recuperative time was new to me, but it makes sense. In my last few years of teaching, I often felt it very important to shut my door for ten or twenty minutes at lunch time and bask in the luxury of some quiet moments before the next onslaught. I suppose this would be anathema to many of my pedagogical compatriots who would make a beeline for the staff room and the comfort of a social situation, perhaps venting their morning's concerns rather than meditating quietly as I would. That's not to say that I am such a hermit that I would avoid the staff room entirely. In fact, I'd probably head there for a while after I had enjoyed my respite of solitude. I rather suspect that more than twenty-five per cent of bloggers might be introverts. We're better at writing in our space than talking in shared space. Here is an excerpt from the article about Brian Little on canada.com. After a lecture, he often escapes to a washroom, where he finds an empty cubicle, sits down, pulls up his feet so nobody can find him, and takes a long moment to reflect ... the washroom retreats bring momentary peace and restore Little's true nature. "He once explained this to Peter Gzowski on CBC's Morningside, telling the famous radio host: "After a talk, I'm in cubicle nine." Gzowski confessed that, after a show, 'I'm in cubicle eight.' "
... It's a fine balance, he says, because introverts do make good professors -- or radio hosts -- attuned as they are to other people's cues, constantly scanning the room to make sure they haven't lost anyone. ... The risk is that they can burn out, because in a sense you're acting out of character. That's why we really need those restorative niches. When you're 'on' with that degree of intensity, I think you would burn out very quickly, unless you're able to find those quiet moments on your own. Here I am, where I often am in the morning, reading blogs and, occasionally, looking out the window. I expect to see weather out there this morning, but I don't. So far today, yet another weather warning is bypassing us. The Weather Network has been predicting freezing rain this morning, but it had better happen soon because morning is slipping rapidly away. If freezing rain doesn't eventuate, I hope that their next prediction does — warmer weather beginning with some normal rain this afternoon. Please may it be so. 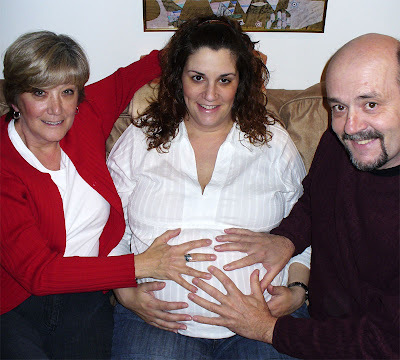 Speaking of blogs, I just read Pearl's most recent post, Born That Way?, which was mainly a link to Nordette's, Are babies really born a blank slate? Of course they're not, but these blogs caused memories to surface. With Smudge's arrival only a month away, I have been wondering what she'll be like. Will she be a placid little thing like her mother or a going-concern like her daddy, or will be be something altogether different? Will she be a quiet, doll-loving girl like Mom, or a more active sports-minded girl like Auntie? The differences between the two are rather remarkable and the type of thing which Nordette spoke of with her two kids. Saturday morning is not the time to write a complete history, but let me share one difference between mom-to-be, Thesha (which is what I now propose to call daughter #1 who has previously been known as Butterfly), and Althegal (daughter #2, previously Bug or Lady Bug). When we first got Thesha home on Christmas Day way back then in the mists of time, we were soon totally flummoxed. She wasn't at all happy, and we didn't know what to do with her. Rocking her, changing her, attempting to feed her produced no results. Then, MIL arrived with Christmas dinner and much expertise. That was one time that I was glad to see MIL, and she didn't disappoint. She took the disconsolate Thesha upstairs and came back down alone in ten or twenty minutes or whatever. Baby was asleep. Young parents were greatly relieved. MIL explained the proper way to handle this baby. Wrap and hold her very tightly and rock her furiously as if you were trying to timewarp her, you and rocking chair into the next century. Strange but true! It worked a like a charm with Thesha. For whatever reason, it was exactly what she wanted. When we'd take her for walks in her carriage, we would furiously bounce it and her up and down ... and she'd be lulled to sleep. Six years later, baby #2, Althegal, joined our family. We soon discovered that all babies were not the same. When I first wrapped Althegal tightly and began to rock frenetically, her petrified and frantic screaming quickly alerted me that such shenanigans were totally unacceptable. This was most definitely not how she wanted to be treated. Not in the least. No, Althegal wanted gentle cuddling and rocking. Oddly enough, she turned out to be the more active of the two, but that's enough recounting for the nonce. And so, I eagerly wait to get to know Smudge and learn about her. Will she be quiet or boisterous, studious or rambunctious, musical or athletic? I look forward to getting to know her and appreciating whatever and whoever she is. I do know that at the very least, I should walk for a half hour each day. And I totally agree with the principal. But I can't bring myself to it these days, for these are the days of March. You might think that someone wouldn't have trouble marching in March, but I can't conjure up a thimble full of enthusiasm for it this week. You see, it's cold out there, and that turns me into a rather reluctant rambler. It shouldn't really, and it doesn't always have this effect in December or January or February. You see, my tiny, little mind equates those months with winter, and I embrace the season to a certain degree. I have walked on very cold days in those months and been quite warm. That's the thing with cold weather; you can pretty well always get warm. You can don layers of space age wonder material and be warm and toasty on the coldest days. I know it, and I've done it. But it's March, and I no longer feel like girding my loins for wintry battle. If it's cold out, as it was today and many days recently, I find myself retreating into a fetal position and whimpering softly in the nearest corner. In point of fact, I can't remember when I last walked. I think it was this week, but it must have been early on — maybe Monday. I haven't been totally bad. I have willed myself into the basement to work out at least twice (it's not as impressive as it sounds), and that's a good thing, and I have done my weekly linedancing tour of duty, and those things do count. Also, just last night, I copied and printed exercises from You: On a Diet. I haven't done them yet, but I have printed them. I have good intentions, you see. Unfortunately, however, it's the season of winter blahs, and I find it hard to soldier on in the cold. That is compounded by the desire to eat more — more junk if possible. Potato chips lure me like the sirens of the deep lure sailors who haven't sighted a wom ... land for night onto six months. While I haven't totally descended into the dank depths of wanton gluttony, I have been making more than my share of bad choices. Strangely enough, however, I almost feel defiantly uncontrite (which spellchecker informs me is not a word) over my fall from grace. But, it's supposed to warm up to above freezing on the weekend. It may even rain and wash away some of the snow and maybe some of my lethargy and cravings. It will happen relatively soon. Spring will come, and we'll be celebrating new beginnings. Before long I'll once again feel good about our four seasons — even the winter part. It just overstays its welcome. That's all. Just to keep in touch these days when I am feeling somewhat reticent, I'd like to share another picture with you. Last September, Cuppa's sister niece stopped on their way to and from a road trip to The Maritimes. They sort of had a Thelma and Louise thing going. Somehow, it's one movie that I've missed, and I don't know which is which, but they had a ball. Cuppa wrote about them and posted their Thelma and Louise photos here. Today, I was given the task of creating a porcelain-effect on a photo. Following the instructions, this is what I came up with. While I'm not sure how porcelain it is, I like. You like? No artist I, but this week's Photoshop lesson was to produce a digital painting, so that's what I tried to do. So, it's not just a photo that has been filtered, but it's all done with choosing colours and making brush strokes. I don't know if I'll ever go to the bother of doing that again, but it was an challenging stretch for me, and I think I ended up enjoying the task. It was based on a photo that I took several years ago. Sigh ... having said that, I recalled probably blogging the photo, and, of course, that made me simply had to find it. Fortunately, Google has a fine search engine that found it for me in seconds. When I say, "No artist I," I'm not kidding or being falsely modest. I was in grade four when I realized that I couldn't draw worth beans. So, I guess I surprise myself by doing as well as I did with this. When I say that I can't draw, I mean that I cannot mentally conjure any image at all when I'm trying. Although my mind certainly visualizes when my brain is on automatic pilot, I simply cannot bring any object to mind at will, and nobody ever told me that it was okay to actually draw something that you were actually looking at. You may or may not recall my ... er ... em blog of several weeks past. Much of it had to do with driving out of town for medical exam of the ... er ... em area. That was just over two weeks ago, and today was the follow-up. You know what? Another storm — worse this time — bad enough to cancel the appointment. That's not all good either as I must still face it but have to wait on tenterhooks for more than a month from now this time. That's not exactly a quick fix doctor. The good part was that I was able to not have to undergo a miserable exam on a miserable day. That's at least one too many miserables. Another good thing was that our neighbour let me use his little, electric snowblower. A boy toy! Yay! It's an odd little life, isn't it? Just today, I was thinking about luck and how some people have it and some don't. I was thinking of it in terms of such things as games of chance, including lotteries and draws. I don't really consider myself lucky in these areas although but random flares (not lightning, surely) do light up my sky from time to time. In many ways, such as career, marriage, and children, I have lived what some might see as a charmed life, but I don't think most of that is really luck. I think it has more to do with being perceptive and using a modicum of wisdom in one's choices. Maybe not, but that's how I tend to think of it. Linedancing here is free, but they have a little 50/50 draw every week. They sell one ticket for two bucks or three for five, and because both Cuppa and I are able to take advantage of the free night out, I feel duty-bound to buy three tickets every week — every week for well over a year now. They sell maybe 40 tickets give or take, so we purchase almost 10% of the total — or 7.5% if you insist on being a stickler for accuracy. So, you'd think we might win about once every three months or so. Nope! We have only one measly win in our sixteen months. Only one win when I think the odds-gods should have favoured us five times. There are people who buy one ticket per week and win somewhat regularly, but not old AC or his Cuppa. Nosiree. Heck, the prize was even on the low side on the week when we finally won about four months ago on about our first anniversary of attendance. We also used to have a 50/50 draw at the school where I taught. They sold about a hundred tickets per week, but they had three prizes each week so the odds weren't that terrible. In addition to the regular weekly, they'd have a extravaganza at Christmas where they would draw for many, many prizes at Christmas. I'm not sure if I ever one more than once a year, and it was usually the third place, weekly consolation prize of ten dollars. Once again, there were some who won five or six times in the course of a year. Then, there's the Tim's Roll up the Rim contest this time every year. Like most Canadians I find myself there on a semi-regular basis and had yet to win: no car, no plasma TV, no bicycle, no donut, not even a blinkin' cup of coffee. Cuppa has one the odd donut or coffee, but even her rate is probably less than one win per year. This year's contest just began, and my first cup was the usual loser (see photo below). On the heels of another loss at linedancing the other night, I couldn't help but ponder all of the above ... and more ... such as our neighbour winning a trip to Ireland from a concert that she didn't attend but that I did attend. But, you see, I am even unlucky in blogdom because I picked up a coffee on the way home from my music lesson today. Wouldn't you know it? After all of these musings, I won a cup of coffee. Of all the rotten luck. Now I can't even blog about my lack of luck. So, I have no idea what to write about. Any suggestions? PS: Lanark is the name of our county.